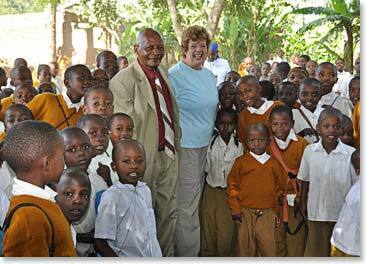 Dave and Darcy’s first stop in Tanzania, Africa was The Children’s Amani Home in Moshi. Since it was founded by Tanzanians in 2001, Amani has rescued hundreds of children from the streets, where they face a high risk of HIV transmission, malnutrition, and abuse. They saw first-hand the happiness of the children, the success of the school, and how donations provided the needed support to move forward and provide the children with the opportunity for a brighter future. While the focus of their trip was Dave’s summit of Mt. 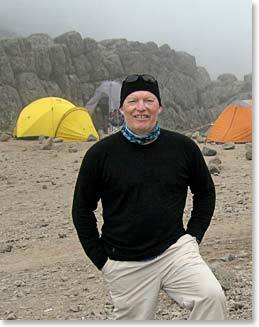 Kilimanjaro, Darcy’s culture tour, and their wildlife safari, Dave and Darcy wanted to visit the Linde School, located in the remote, dry flatlands between the town of Moshi and city of Arusha. 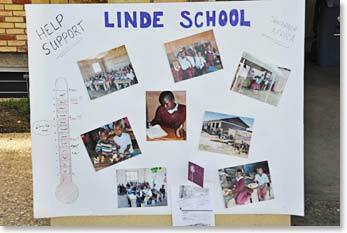 In its infancy, the Linde School receives no government funding, yet manages to provide almost 100 children, who do not have the money for school, the opportunity for an education. Some of the children walk for several hours in their uniforms to and from school every day, excited to learn! Compared to the Amani Home which is well recognized and funded, the Linde School has not received the awareness, attention, or donations that the Amani Home has. Many of Berg Adventures’ climbers have contributed through the years, and donations from other organizations have made the Linde School a better place, but it still has a long way to go. On route to the Linde School, you turn off the main highway onto a dirty, bumpy road, for a 20 minute drive past a few small houses, farms, wild dogs, roosters and skinny goats in the front yards. Around a corner, in the middle of a dirt field, sit three simple structures housing four school rooms and a small office. The space between the buildings fills with many children as they anticipate the arrival of their new guests and prepare to sing welcome songs! Anyone who visits the Linde School gets the opportunity to hang out with the children, but neither Dave nor Darcy were prepared to teach the children. Shortly after arriving in a Grade 4 English class, the teacher introduced himself and then left Dave alone! Not knowing much Swahili himself, Dave was relieved that the children already knew English quite well and that their notebooks neatly recorded the lessons of the morning. In another room, Darcy found herself teaching a rather large and highly spirited class of Grade 3 students. They each found it quite challenging to be put in charge of a classroom of African children with no lesson plan or teaching certificate! Dave and Darcy had made arrangements in advance to provide lunch for the school and were truly surprised to find that a small plastic shelter with a dirt floor served as the kitchen for 125 children, teachers, helpers, and guests. Wood from nearby trees fueled an open fire upon which the chef and helpers cooked a beautiful spread of goat stew, vegetables, potatoes, rice, and fruit, served buffet style. Everyone including the teachers enjoyed an enormous hot meal. To their surprise, there was not a crumb left as many kids came back several times for more! After lunch the children sang songs for Dave and Darcy and the teachers thanked them for coming to visit. While driving away, the children ran with the car, waving goodbye. On the drive home, Dave and Darcy learned from Angel that the school provides a basic breakfast and lunch for the students and teachers when there is enough food. 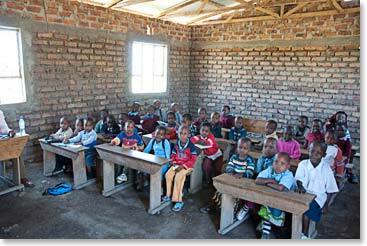 Food is bought for the school through donations and costs about US$300 per month. While happy that they had just provided an exceptional treat for the children, Dave and Darcy were upset because they had just spent US$200 for one meal when, for another $100, the children would have been fed for an entire month! Neither Dave nor Darcy could get this picture out of their mind and they wondered if there was a way to raise money to help feed the children. A full tummy is very important for health and nutrition and is also essential for learning. Many of the children come from families that are so poor that they are not always able to feed them. There have even been times when the food money runs out and the teachers work for months without pay. The teachers are committed because they are passionate about their job and see the benefits to the students. After returning to Canada from their adventure, Dave and Darcy’s friends, relatives and business associates were waiting with eager anticipation to see their photographs and hear their stories first-hand. There were numerous showings and each included a few pics and stories of the Linde School. Most people were genuinely interested so Dave seized the opportunity and told his guests that he would host a garage sale to raise money for the school. It would be a fantastic opportunity to share their African experiences, invite everyone to donate their unwanted household items, and feed the Linde children for a year! So e-mails went out, everyone was invited over for burgers and beer the Thursday evening before the garage sale, and donations literally came pouring in! The garage sale was an overwhelming success. Throngs of people attended and most were very, very supportive when they learned that the proceeds were going to feed a school for an entire year. Several people that Dave and Darcy didn’t know bought garage sale items and then went home and returned with more donations. Others didn’t buy anything but still donated a few dollars and at the end of the day, over $2,500 had been raised! Other donations also helped achieve the goal of $3600. Dave and Darcy are truly admirable with their continued efforts to bring more awareness and raise funds for the Linde School. Through their efforts and the donations they received, the school now has food for meals, clean water for cooking, and water for their new school garden to grow their own vegetables. All of the current students have uniforms to wear and smiles on their faces as they get the opportunity to continue with their learning. Even with all of these efforts and success with the donations, one of the big challenges is to sustain the Linde School and keep it running. The yearly cost to keep teachers paid, feed the children, buy new uniforms, maintain the school, and protect it from weather is significant. With the dedication of people like Dave, Darcy, and other Linde School supporters, the children’s dream of an education is becoming a vivid reality.